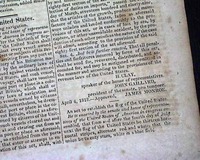 Shown is an original & historic old newspaper, offered to enhance your collectible interest: NEW YORK SPECTATOR, May 1, 1818 * United States Flag revision The back page has over 2 columns taken up with a very lengthy list of Acts of Congress which were recently passed. Included very inconspicuously within the list is: "To establish the flag of the United States--House, April 4, 1818." (text of the Act not included: see) This was the historic Act which formalized how the flag would be altered in future as additional states join the Union. Four pages, nice condition. 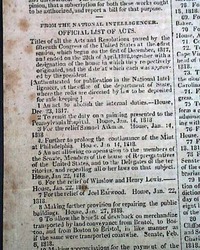 Shown is an original & historic old newspaper, offered to enhance your collectible interest: NILES' WEEKLY REGISTER, Baltimore, May 9, 1818 * United States Flag revision The last two pages contain a rather inconspicuous yet very historic report from Congress, being a printing of: "An Act to Establish the flag of the United States" with the text including in part: "...the flag of the United States be thirteen horizontal stripes, alternate red and white, that the union be twenty stars, white in a blue field...that on the admission of every new state into the union one star be added to the union of the flag..." with this Act of Congress signed in type by the President: James Monroe (see). Sixteen pages, 10 by 6 1/4 inches, various foxing, generally good.